Autocorrect can be a blessing and a curse. I actually prefer to use it because instead of meticulously pecking out letters on my phone, I can simply gesture words on the keyboard that are simply close to what I want and Autocorrect intuitively knows what I mean 80% of the time. Well, maybe 70%. When I'm out for a walk, it is freeing to "gesture" my thought into words, sometimes without even looking. This is what I typed once on the way to the car. With the first four letters of "riboght" wrong (<< or bitwise left shift for the coding geeks), Autocorrect magically came up with the correct word "tonight". Brilliant! 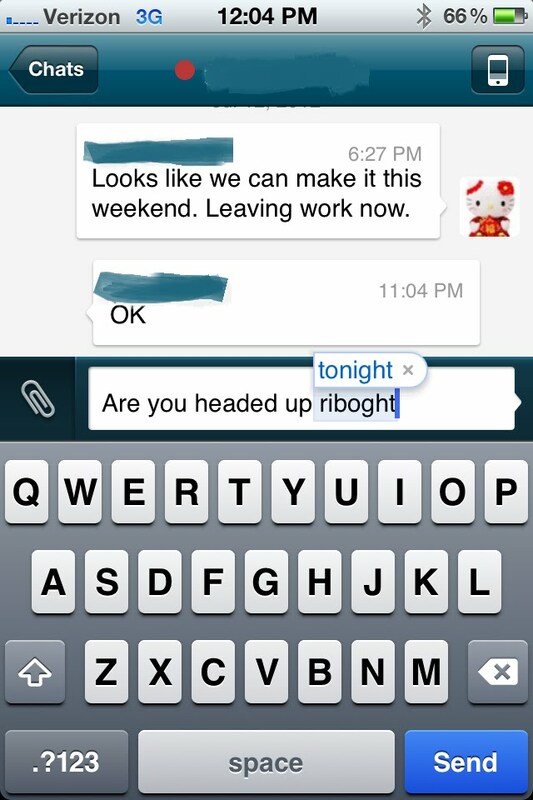 But more often than not, Autocorrect gets it hopelessly and often inappropriately wrong. Here are some goofs caught in the act (before hitting send!). No groping the nanny! I don't even remember what the real word was supposed to be. No, T&A should never enter into a conversation with another mom. 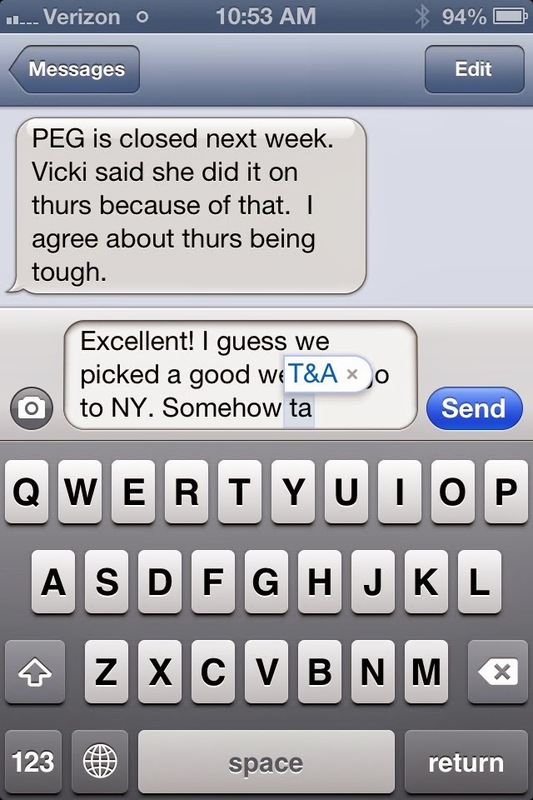 And to the point that Autocorrect "learns" your common phrases, "groping" and "T&A" have never been used before! Autocorrect definitely has a dirty mind. The kids and I had a blast watching the Clumsy Thumbsy segment from The Ellen Show on YouTube (all PG-ish). This is what happens when people actually send the wrong Autocorrects. Many of these can also be found on DamnYouAutocorrect.com (not always so PG-13). My personal favorite has renamed my beloved Autocorrect to "Auto Cat Rectal" (note in the Ellen version, "rectal" is left off). And the best collection of this site goes to Top 10 Misunderstanding with Parents. Completely not PG-13 but oh so funny. Adam turned off his Autocorrect on his phone so hopefully we won't have any mishaps like those. Then again, I better keep an eye on my own auto cat rectal text gesturing.